Samsung today announced in a press release that it has officially begun mass production of its latest Serial Attached SCSI (SAS) SSD - the PM1643 - which is squarely aimed at the next-generation of enterprise storage systems. These drives are built using the company's latest 512Gb V-NAND technology - in a 64-layer array -, in addition to offering an industry-first 1TB NAND flash package and 40GB of DRAM. This means that not only will it be able to meet demanding storage needs but will outperform the previous 15.36TB SSD - introduced back in March of 2016 - by a factor of two. The company explains that this achivement was made possible "by combining 32 of the new 1TB NAND flash packages, each comprised of 16 stacked layers of 512Gb V-NAND chips." As an example, the company points out that 5,700 5GB full HD movie files can be stored on a single 2.5-inch drive using these chips. Samsung also boasts of the performance these drives can deliver, with the PM1643 capable of hitting "up to" 400,000 input/output operations per second (IOPS) in the company's own random read tests, and 50,000 IOPS in random write tests. Meanwhile, sequential speeds come in at 2,100MB/s for read and 1,700MB/s for write tests, per the company. 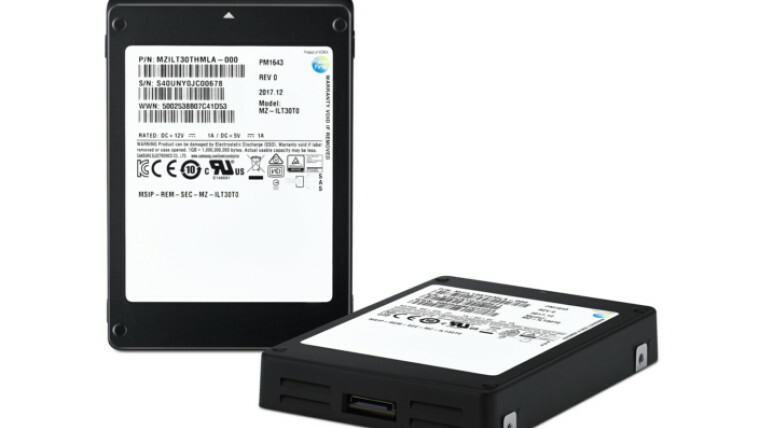 According to Samsung, the new drive performs approximately four times better than a typical SATA SSD; as these drives are focussed on the enterprise, the company also noted that they offer a mean time between failures (MTBF) of two million hours. Although manufacturing already started on the 30.72TB SSDs back in January, this will be further expanded later this year to include capacities of 15.36TB, 7.68TB, 3.84TB, 1.92TB, 960GB, and 800GB; earlier this year the company also announced the SZ985 Z-SSD, which is tailor-made for high-performance computing (HPC) applications in the enterprise, with a capacity of 800GB.